Painter Reginald Grenville Eves trained at University College School, London, winning the Trevelyan Goodall scholarship in art, and at the Slade School of Fine Art under Alphonse Legros, Frederick Brown, and Henry Tonks, where he won a Slade studentship. After five years in Yorkshire, he returned to London in 1901, taking a studio in Fitzroy Street and exhibiting for the first time at the Royal Academy. He married the artist Bertha Sybil in 1903. Eves became a successful and fashionable portrait painter, particularly after exhibiting a much-praised portrait of Sir Herbert Cozens-Hardy (1912) at the Royal Academy, where he became a regular exhibitor until his death in 1941, also exhibiting at the Royal Institute of Oil Painters and the Paris Salon (winning a gold medal in 1926). He specialised in male sitters, painting many of the most prominent figures of his day including George VI (1924), Sir Ernest Shackleton (1921), Thomas Hardy (1923 and 1924), Sir Frank Benson (1924), Stanley Baldwin (1933), Lord Jellicoe (1935); and Max Beerbohm (1936). He became an ARA and in 1939 an RA. In 1940 he was appointed an official war artist, and in 1941, at the time of his death, eight portraits by him of war leaders were on exhibition at the National Gallery. 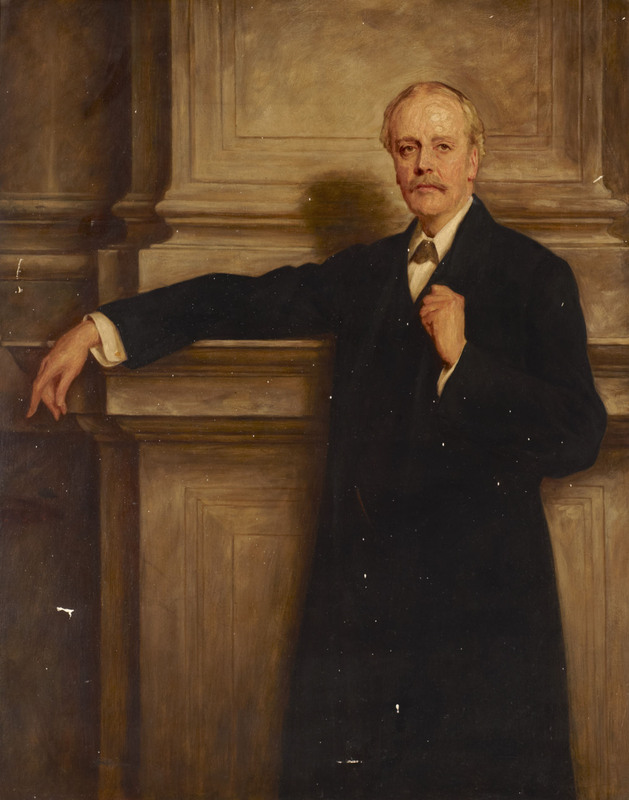 The sitter in this portrait is the British Conservative politician Lord Balfour (1848–1930), who served as Prime Minister from July 1902 to December 1905, and later as Foreign Secretary, in which post on 2nd November 1917, he made the ‘Balfour Declaration’: confirming, in a letter to the 2nd Baron Rothschild, government support for the establishment of a Jewish national home in Palestine. The portrait is based on a highly commended work by John Singer Sargent (1908, National Portrait Gallery), portraying Lord Balfour within a classicised interior, commissioned by subscription from members of the Carlton Club and exhibited at the 1908 Royal Academy exhibition. It is attributed to Reginald Grenville Eves, who made numerous copies of portraits after Sargent, including one of actress Ellen Terry. In this work Balfour is seen in a three-quarter length pose (rather than full-length as in the National Portrait Gallery work), some details of the composition have been omitted, and the painting of the face though less smooth and finished, retains a direct gaze and patrician exterior.